Caitlin Chadwick’s world turns upside down upon the death of her grandfather. Bittersweet memories tug at her heart as she considers selling the only place she ever called home. Garrett Winston is a true friend and gentleman, but Caitlin wants love and romance from him. Will he ever release the past so he can have a future with Caitlin? What happens when Scott MacKay blows into town bringing turmoil, uncertainty, and confusion? Both men are vying for her heart and soul. Can one man have both? 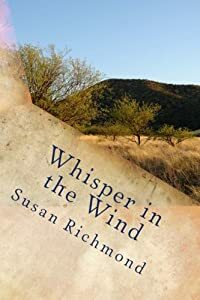 Whisper in the Wind is a sweet, adult romance that reminds us of what it’s like to fall in love. You will experience those feelings of doubt and insecurity when you don’t know how the other person truly feels about you; the jittery feeling of proposing to the one you love; and finally the excitement of your wedding day. Come along with Caitlin as she journeys through a world we call life.